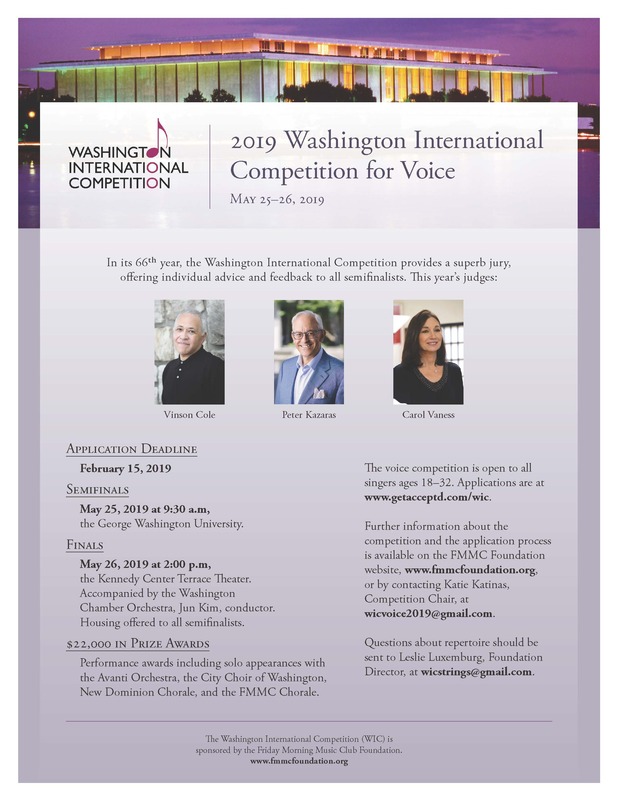 In its 66th year, the Washington International Competition for Voice supports outstanding young singers between 18 and 32 by providing financial awards and performance opportunities to the winners. Located in Washington DC, the finals will take place on stage at the renowned Kennedy Center in the Terrace Theater on Sunday, May 26, 2019. For the first time ever this event will be accompanied by a Chamber Orchestra. Application materials are available at: www.getacceptd.com/WIC. Semifinalists are invited to attend live auditions in Washington DC where they will perform before our esteemed judging panel, Vinson Cole, Carol Vaness and Peter Kazaras. Performance awards include solo appearances with the Avanti Orchestra, City Choir of Washington, New Dominion Chorale, and FMMC Chorale. Visit www.fmmcfoundation.org for List of Competition Requirements.